Quang Ninh (Quảng Ninh) is a famous province for marine tourism. In addition to Ha Long (Hạ Long), Co To (Cô Tô), Tra Co (Trà Cổ), and Quan Lan (Quan Lạn), there is an island that has recently been exploited its tourism potential and invested infrastructure, attracting many visitors: Cai Chien Island (Đảo Cái Chiên). Cai Chien Island belongs to Hai Ha district (huyện Hải Hà). It is about 350 kilometers far from the center of Ha Noi and 8 kilometers from Ghenh Vo port (cảng Ghềnh Võ). The natural area of the island is approximately 2500 hectares; most are hills and beaches. Everyone who has ever set foot in Cai Chien Island will certainly be impressed by its pristine and poetic beauty. With a long white sandbank and soaring casuarina, the island brings people a gentle and peaceful feeling. Especially, the sea water here is so clear and twinkle that even rain could not lose its turquoise color. Each season of Cai Chien has its own unique character. The only thing you need to do is raise your camera and catch the gorgeous moments. Cai Chien lies in the climate of the Eastern North mountainous region with hot summer and cold winter, which is the coldest in comparison with other seas. The rainy season of Cai Chien lasts from June to October. This is also the most suitable period to go swimming in the North. If you have a plan to explore Cai Chien, take the initiative to monitor meteorological forecasts for weather information before leaving. A small note is that the highest rainfall is usually in July. Therefore, you should avoid visiting the island at this time for your safety. I. How To Get To Cai Chien Island? You can catch a coach to Mong Cai (Móng Cái) at any large station and get off at the intersection of Ha Coi bank (ngân hàng Hà Cối) on Ly Thuong Kiet street (đường Lý Thường Kiệt), Quang Ha town (thị trấn Quảng Hà). From here, take a taxi or a ride to Ghenh Vo port, which is 10 kilometers away. At Ghenh Vo port, you will find the ferry to go to Cai Chien. You are allowed to bring on the ferry your personal means, so if you want to drive yourself, follow the Ha Noi – Hai Phong Highway/QL5B (Đường cao tốc Hà Nội – Hải Phòng) and Ha Long – Hai Phong Highway/QL18 (đường cao tốc Hạ Long – Hải Phòng) until you reach the port. You will take a ferry to get to Cai Chien Island from Ghenh Vo port. Every day there are 3 ferries depart from the 2 terminals with the departure time from Ghenh Vo is 7:00, 11:30, 17:30 and from Cai Chien is 6:00, 10:30, 16:30. On Saturday and Sunday, the number of trips may increase depending on actual needs. However, due to the occasional changes in the schedule of the ferry, you should contact phone numbers 0166 575 2664 or 0984 019 624 for more details. Another option is to rent a canoe to the island to save time as it only takes about 15 minutes instead of more than half an hour going by ferry. This option is appropriate for large groups or families. II. Where To Stay In Cai Chien Island? Bui Van Hoan homestay (homestay Bùi Văn Hoan) is always in the state of exhaustion because lots of visitors choose this place as the accommodation during their stay in Cai Chien Island. The homestay provides double rooms for couples with the price of 500.000 VND/night and collective rooms for groups of 8 to 10 people with the price of 70.000 VND/night per person. Rooms are fully equipped, neat, and clean; the host is very enthusiastic and willing to help you have a memorable vacation. You can contact Mr. Hoan before coming through his Facebook account. This is the most well-known homestay of Cai Chien Island that stands out with its impressive design and vibrant colors. The homestay was closed in 2016 but returned in the summer of 2018 to continue serving tourists. Room rates are 450.000 VND/night on weekdays and 500.000 VND/night on weekends. Each room is equipped with an air conditioner and consists of 2 double beds, which can accommodate 4 to 5 people. 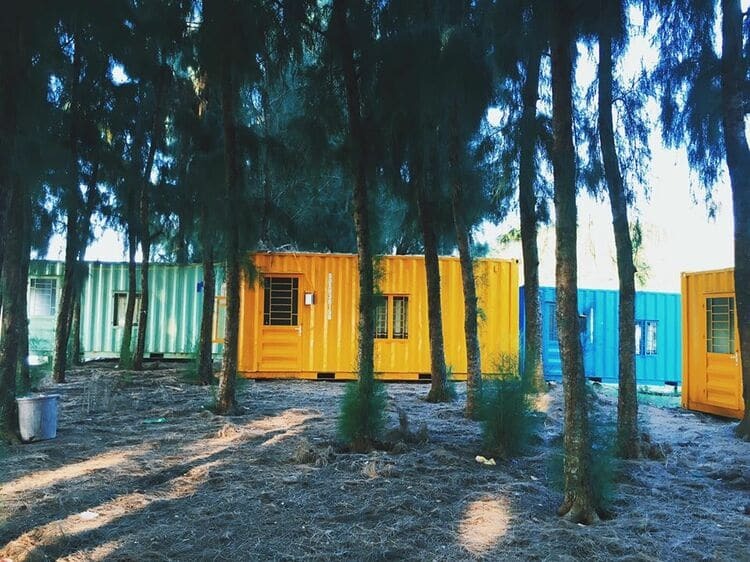 One plus point of this homestay is the location right in the middle of the shady casuarina forest and also near the beach, enabling visitors to get exclusive photos. Tuan Hien hostel (nhà nghỉ Tuấn Hiên) has just been built, so everything is still new. Rooms are airy, clean, and extremely comfortable. The price is affordable, 400.000 VND/night for a double room. Moreover, you do not need to be shy when staying here because the hosts are very nice and hospitable. III. What Are The Attractions In Cai Chien Island? 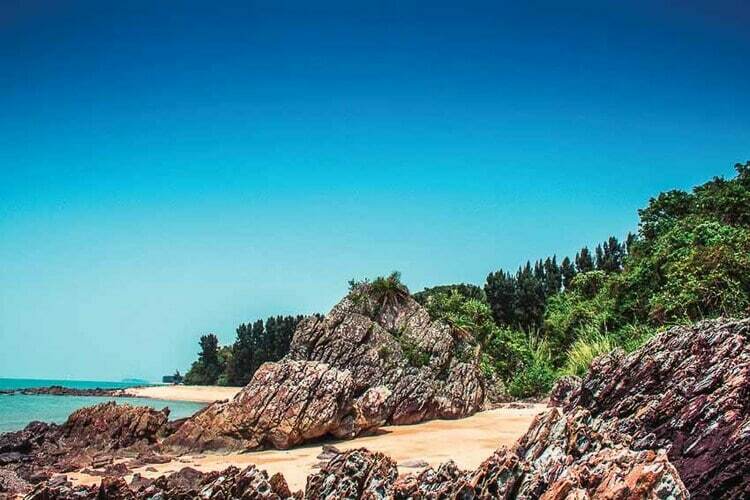 Cai Chien Island is considered the most serene and lyrical beach in Vietnam. It will be a wonderful memory when you and your partner have an early morning watching the dawn on the island. The sound of waves crashing against the shore, the murmur of casuarina combining with the pure sunshine, all pf which make everything incredibly blissful and warm. Let’s hold hands and hum some love songs; you will forget all the mess of busy life. From sunrise to sunset, Cai Chien is still perfect and special. Honestly, this island is an ideal one for a couple in love. Watch the sun setting in the sea, share hard-to-express thoughts together, or close your eyes and lean on the other’s shoulder; nothing can be more romantic. Dau Rong (Đầu Rồng), Cai Chien (Cái Chiên), and Van Ca (Vạn Cả) are beaches that you will not regret spending your time at because of their beauty. You can walk along the seaside, go swimming, sunbathe on the beach, or string a hammock to relax in the casuarina forest. 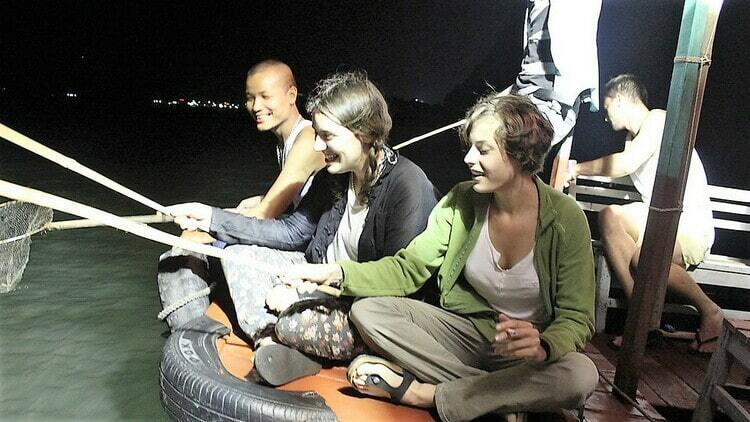 Night squid fishing on Cai Chien Island is an experience that you will always keep in mind. You can rent a boat to join the fishermen in fishing, and depend on how lucky you are; you will end up with more or less squid. Campfire and BBQ is an exciting collective activity for the nights in Cai Chien. If you have planned to camp off the coast, just spend a few hundred thousand dongs to buy a bundle of firewood and food from the people on the island, along with the squid that you acquired previously, you will have an unforgettable night. If you are a big fan of seafood, it will be the right choice to come to Cai Chien. All seafood here is caught directly and sold in-day, so you can reassure of the freshness and safety. Because there are not yet advanced restaurant systems, the dishes are simply prepared by the Islanders. However, being able to enjoy crabs, shrimp, oyster, and many more kinds of seafood is still very delightful. In particular, the price for each meal that is full of seafood is only 100.000 VND/person. In Cai Chien, do not think, just eat. The lovely Cai Chien island will surely bring you lots of surprises, and it helps you to escape from the noisy urban life and to have relaxing moments. Of course, living conditions are an important element of any trip. Although pristine, Cai Chien’s service has been developing day by day to serve visitors more attentively. We hope through this article, you have somewhat grasped the most basic information to have a convenient and successful island trip in the nearest time. To find more attractions to visit in Vietnam, please go to our Vina site. If you have any question or comment, do not hesitate to write below, we will respond as soon as possible.